And this is the official last empties post from 2017! After the previous empties post part 1, which focused on cleansers, we're going to look at all the other various leave-on products! There's quite a lot to go through here, including masks, lotions, moisturizers, sunscreens, and more! Aaaand, this is the last of the 2017 empties! Truth be told, I'm always surprised by how much skincare I use up whenever I do one of these empties posts, especially because I don't think of myself as the kind of person who religiously masks her face every week or even slaps on serum every night! Believe it or not, when I'm really tired after a long day of work, I go to bed with no skincare on! The very horror! But sometimes you just gotta sleep, you know? In any case, I attribute my ability to use up my skincare to my large face, haha. I guess a larger surface area does use up more product! There's a lot of empties here to round off 2017 - I'm surprised I used up all this! So, let's get started, and finally wrap up 2017 in beauty on this blog! Let's start with the moisturizers. First up we have The Face Shop Blanclouding White Moisture Cream. The idea behind the name "Blanclouding" is that the cream is supposed to offer some "cloud cover" for your skin, so that you are protected from UV rays and the like. This was a pretty good moisturizer, and I wouldn't mind using it again. It had a nice light texture. 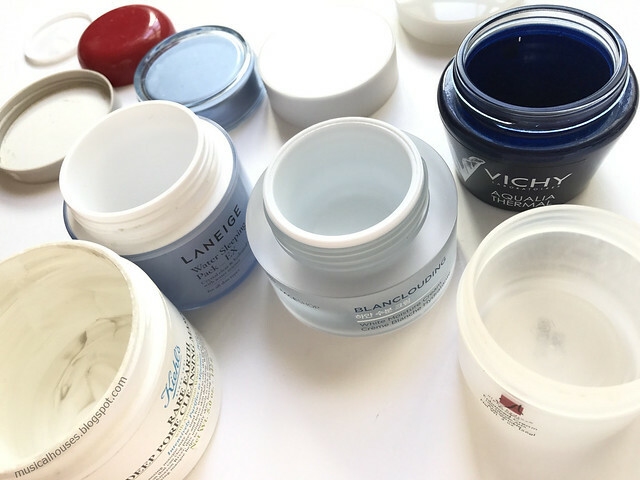 I also have the Alpha Hydrox 10% Enhanced Wrinkle Cream, which I've been using on and off for literally years - check out the very first empty post to feature this way back from 2014! I love love love this product because it has 10% glycolic acid, and glycolic acid happens to be one of the acids that I have better luck with. And my opinions on the Enhanced Wrinkle Cream are pretty much the same - I love it, it's awesome, but if you have sensitive skin, or are otherwise sensitive to acids, please do a patch test prior to slathering it on your skin! Also, if you have open wounds on your skin, don't use it until they have healed - it will sting the open cuts and wounds like crazy. Lastly, using a strong AHA like glycolic acid can make your skin more photosensitive, so if you're using this at night (and you should only use this at night, and not during the day), you do need to wear a sunscreen in the day. Alpha Hydrox has since rebranded themselves as Alpha Skincare, and the product is now the Essential Renewal Cream with 10% AHA. When I use up all my current backups of the Enhanced Wrinkle Cream, I will definitely try out the rebranded version to see if it's similar. Another plus point about Alpha Hydrox/Alpha Skincare products is that they aren't expensive. It's quite hard to find budget AHA products that actually work, so this is definitely something I'll be using for a long time. Now, let's take a look at the masks and sleeping masks. First, there's the Kiehl's Rare Earth Deep Pore Cleansing Masque. Like a few of the other products, this has been a product I've also used previously and featured in an empties post from 2015! I thought this was a nice basic clay mask, although I didn't like the tingly feeling that I got whenever I used the mask. I know some people like that tingly feeling, but on my sensitive skin, I found it a bit too much. Otherwise, this was a pretty nice clay mask. And on to sleeping masks! I've been using the Laneige Water Sleeping Pack EX as a day moisturizer actually, although it's technically a sleeping pack. 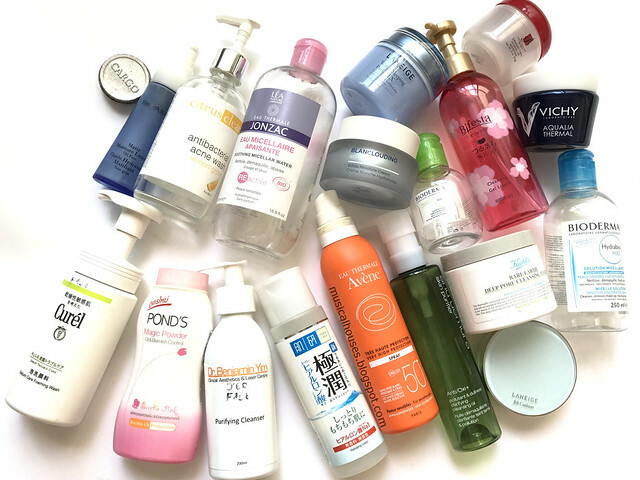 If you've seen my previous empties posts (like this recent post from 2017, and this one in 2016 and also this one in 2015), you might have seen me mention this before. There isn't a particular reason for my decision to use the Laneige Sleeping Pack as a day moisturizer - I guess I just found that the lightweight gel texture really suited it better to day use than night use, and also, there wasn't anything in the ingredients list that screamed "USE ONLY AT NIGHT", in that there weren't any acids or retinols or that sort of thing. So day use it is! As a day moisturizer it worked well under a variety of sunscreens and makeup bases, so although it's a bit pricey for a plain old day gel moisturizer (which is what I was using it as), it was perfectly servicable. In other "sleeping packs used as day moisturizers" news, I've also been using the Vichy Aqualia Thermal Sleeping Mask as a day moisturizer! Oh, the horror, haha. I actually reviewed the Aqualia Thermal Sleeping Mask back in 2015, and I did mention then that I thought it was suitable for day use as well, not just night use. Well, I've been using it for day use, and I can confirm it is just a-okay for it! The nice light gel really works well as a day moisturizer, and I do like that it has a fairly simple ingredients list that doesn't complicate matters, like interfere with your primer or sunscreen. It works well as a basic day moisturizer. Now that I'm done explaining how I've been using my sleeping masks as day moisturizers, let's look at products I've actually been using as intended, haha! First up, a "you see this so frequently I don't have to explain it to you again" product, the Hada Labo Gokyujun Hydrating Lotion. I've always been a pretty big Hada Labo fan, and I do like their lotions very much. The various Hada Labo lotions have appeared in so many empties posts I can't even compile them (I mean basically almost every empties post has one, especially the more recent posts). I like these lotions - they have no fragrance, a comparatively simple ingredients list that generally isn't likely to irritate sensitive skin, and they really do have some very interesting technology that is just specific to the brand, namely their small-chain hyaluronic acid molecules, which I was told is only available in their products. So, I know I sound like a broken record by now, but yes, I will keep repurchasing their lotions and using them for a long time! Another "will keep repurchasing and using" product is my trusty old Avene Very High Protection Spray SPF50+ Sunscreen. Again, this is one of those products where if you've seen any of my previous empties posts, you will know that this has shown up again and again and again. Yep, it's a great sunscreen, and I like how I can get it for cheap in huge 200ml bottles, and so I don't feel bad slathering the necessary 2mg/cm2 measurement of sunscreen on my face (2mg of sunscreen per cm2 of exposed skin area, for those wondering). 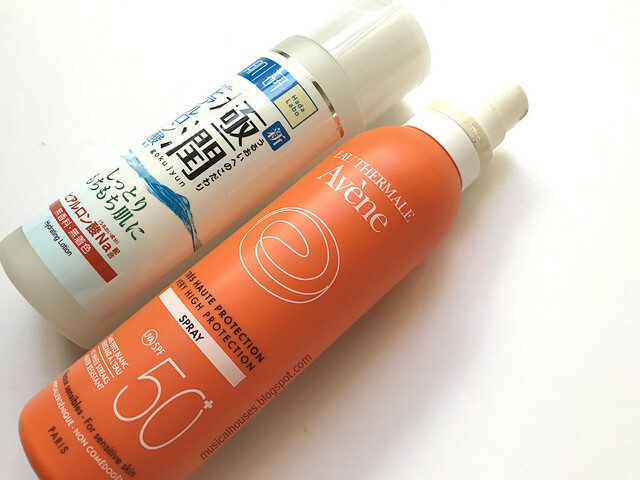 It's not the most cosmetically elegant in terms of sunscreens - honestly it can leave a white cast and the texture is thicker than the Japanese or Korean brand sunscreens, but it really does offer long-lasting protection. I've stood out in the sun for hours and still had this hold up, so I'm happy to keep using it when it has proven itself like that! Lastly, check out my piddly little bunch of makeup empties! Unfortunately makeup just gets used up at a slower rate than skincare, although I daresay I tend to buy makeup at a faster rate than skincare. It's not my fault, blame all the makeup for being so pretty! Anyway, I used up an old standby, yet another bottle of Pond's Magic Powder, which I've been using since...2010? Or something like that? Oh wait, actually it's 2011, based on this haul post. Whoops! Again, I've used so many bottles of this, and have featured them in so many empty posts that I don't know what to say. 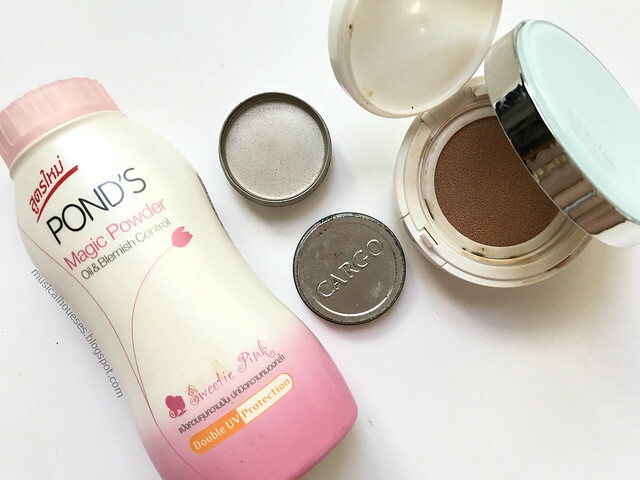 It's so cheap, it's pretty good, and I like mixing it with other (more expensive) powders. It's a great basic to have around. Aside from that, I have a not-too-ancient Laneige BB Cushion Pore Control in shade #13, and I really like this stuff. As you might expect with a cushion for oily skin, it dries down to a matte (and I do mean matte) finish, and is thus great for hot sweaty weather. It also holds up well and doesn't present any problems with respect to oxidation. I do like this and would consider repurchasing, if I didn't have a bunch of cushions to use up first. But this is definitely on the "would repurchase" list! So, that officially wraps up the last of my empties from 2017, and I can't wait to pan/use up more of my stash in 2018! I also like Hada Labo Gokyujun Hydrating Lotion, but now I'm interested - hop do you use it properly considering that it's a lotion? @F: I just use it somewhere near the start of my routine! It varies depending on exactly what type of product I use it with (generally I follow the principle that if in doubt layer from least emollient/occlusive to most, or thinner to thicker). So if I'm pairing it with a super watery serum/essence the serum/essence may go on first, but if it's a cream I'm using it with, the cream will go on after. I don't personally favour super long routines (I'm impatient that way) so I typically do lotion, serum, maaybe a moisturizer, eye cream, then sunscreen. Hole that helps!